Fernham Homes has released the final phase of new homes at its Pearsall Place development in Borough Green, Kent. 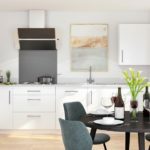 The housebuilder reports that first-time buyers are ’flocking’ to the final release of new homes at Pearsall Place which consists of two-, three- & five-bedroom homes. The homes, which feature Wealden-style architecture, along with high quality specifications, include special touches like underfloor heating on selected homes, Quartz stone worktops and integrated appliances.